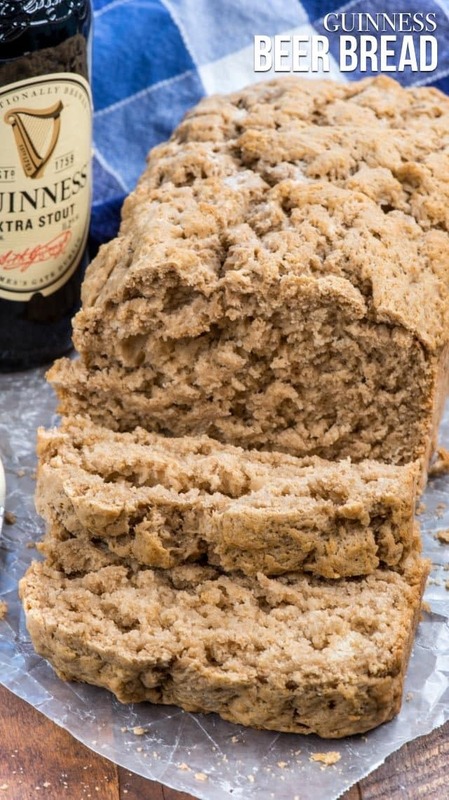 Easy Guinness Beer Bread has only 4 ingredients! This bread recipe is the perfect side dish for stew or soup, especially on St. Patrick’s Day. 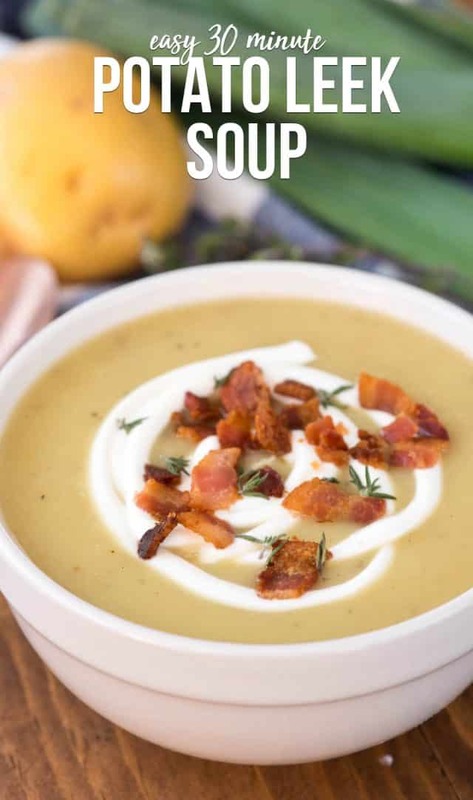 Or, make this with any beer you like on any day of the year! Bread is something that goes so well with soup…so next time you’re making some you should whip up a batch of this. I have to be honest: I don’t like beer. I’ve tried, really. When I was young I’d drink a Bud at a party to impress the guy I liked or nurse a Corona with lime for an entire afternoon just like all the other girls at the party. One of my boyfriends liked Guinness and I remember trying to drink it and just being like…NO. Luckily, once I met Mel I’d realized I’m going to drink what I want to drink and beer is not what I’m going to choose. Every once in awhile I’ll tell myself my tastes have changed and take a sip of his and am still like, yeah NO. I’m a wine or a vodka girl, through and through. HOWEVER: I still like beer in my bread. Especially when it’s GUINNESS in my bread! Whenever I make soup or stew or salad, I always want a side of bread. This easy beer bread recipe has only 4 ingredients and comes together in minutes so it’s an easy side dish for any time of the year, especially if you’re making beef stew or corn beef and cabbage for St. Patrick’s Day. I don’t know what the best beer for beer bread is, but I’m going to give it a go and say that it’s Guinness. Guinness is a dark and rich beer, which gives the flavor of this bread a savory and rich taste. Regardless of what beer you use (because you can use any kind), this bread is easy to make and easy to eat. With only 4 ingredients, this is an easy bread recipe without yeast, and it’s one we’ll make over and over again! Because this recipe uses self-rising flour, it is a real quick bread. You could probably make this into a sweet beer bread by using a lighter beer and more sugar (or honey) but using Guinness makes it perfectly savory and great with a nice slab of butter. 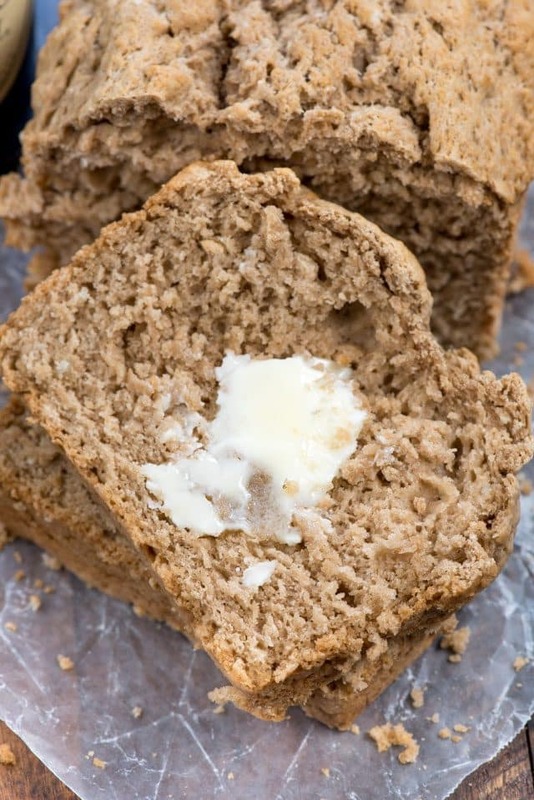 Easy Guinness Beer Bread has just 4 ingredients and is the perfect side dish. We love eating this with soup or stew! One thing that’s great about any beer bread recipe is that the alcohol cooks out; this is a kid-friendly side dish. The bread doesn’t taste like Guinness (remember, I don’t like drinking beer!) but it does lend a savory and rich flavor to the bread. It’s the main component, so even if you don’t want to make Guinness Beer Bread, use a beer you’re in love with. I’m especially interested to try a cider or one of the new flavored beers. Self-Rising Flour: this is crucial for the 4 ingredient label. Self-rising flour is flour with baking powder and salt added in. Don’t have it or can’t find it? Refer to my How to make Self-Rising Flour guide. Sugar: this is also needed. The bread isn’t sweet as it is, without it the bread would be bitter. A little sugar helps every recipe. Because I’m using Guinness, I used brown sugar. Granulated sugar or honey would also work. 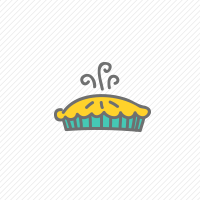 Butter: all good baking recipes need fat. This recipe has melted butter in the bread and on top (for flavor and color). You can also use oil or melted coconut oil, if you prefer. BEER: obviously. 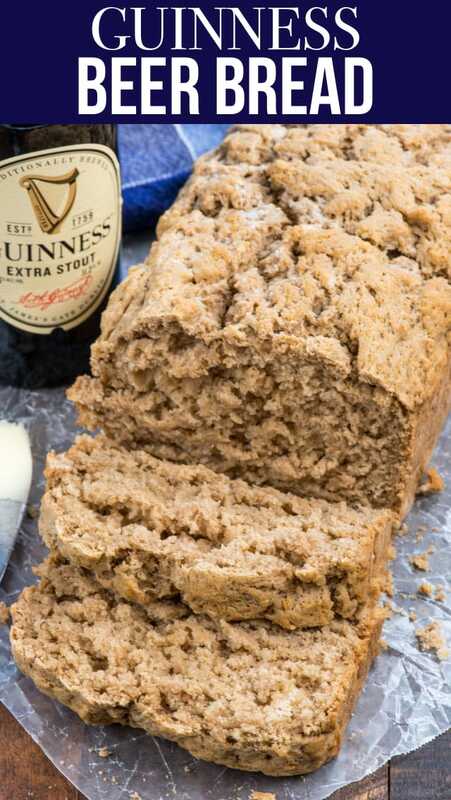 Guinness bread wouldn’t exist without adding beer! I love the flavor of Guinness in this, but use your favorite. The bubbles in the beer help the bread rise…I wouldn’t be surprised if you could this with soda! If you’ve never considered making beer bread, you should. It’s an easy savory quick bread! 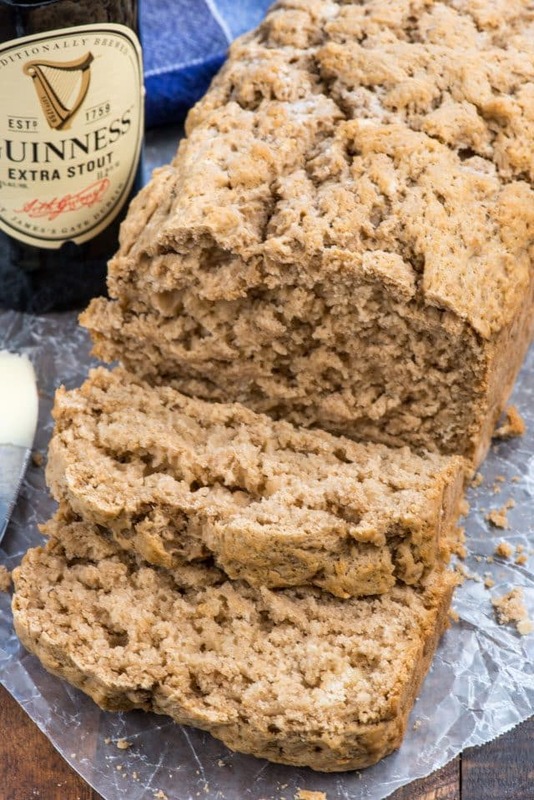 Easy Guinness Beer Bread has only 4 ingredients! 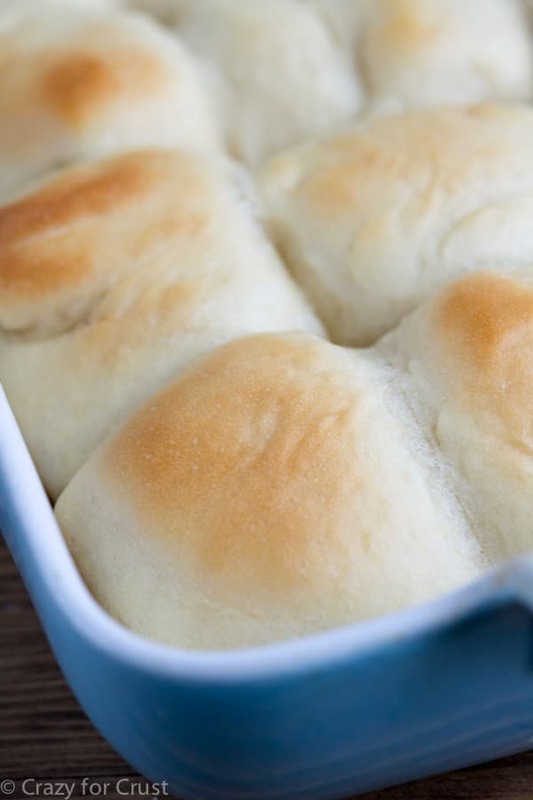 This bread recipe is the perfect side dish for stew or soup, especially on St. Patrick's Day. Or, make this with any beer you like on any day of the year! Preheat oven to 350°F. Spray a 8x4-inch or 9x5-inch bead pan with nonstick cooking spray. Whisk self-rising flour and brown sugar until no lumps remain. Stir in beer and 3 tablespoons of the butter. Batter will be thick. Spread batter in prepared pan. Brush with remaining 1 tablespoon of butter. Bake for 40-50 minutes or until a toothpick comes out clean. Serve warm or room temperature plain or with butter. Eat or freeze within 2 days. This bread is a great side dish to Becky’s Beef Stew or Holly’s Shepherd’s Pie Soup! I hate beer. Like whoa…no beer for me ever. I didn’t know you didn’t like it either. But I do love beer bread! I haven’t made beer bread in years and yours looks so good! This sounds really good with stew. Yum! This looks awesome! Unfortunately Guinness is so hard to come by where I live (Port Elizabeth), so I’d have to swap it with a stout. But will definitely be giving this a go! Made this bread with a light beer turned out great and tastes wonderful. Love it.